The U.S. Energy Information Administration (EIA) released its weekly data on diesel and gasoline retail prices for the week ended December 3, 2018. Retail prices for both fuels dropped significantly in all PADDs countrywide. On a national average basis, gasoline prices plunged by 8.8 cents/gallon, while diesel prices dropped by 5.4 cents/gallon. Gasoline prices have fallen dramatically in October and November, reaching a point where the national average price is now below where it was one year ago. This week appeared to bring an expected delayed-reaction drop in retail prices. Futures prices for crude and products collapsed during the week ended November 23rd. West Texas Intermediate (WTI) crude futures prices dropped by $6.61/b during the week. Gasoline futures prices collapsed by 18.65 cents/gallon. Diesel futures prices plummeted by 20.24 cents/gallon. Retail prices during the week ended December 3 declined, but not nearly at the rate that futures prices fell. As of the time of this writing, WTI futures crude prices have pulled out of their 7-week downward spiral, and they are back above $53/b. However, retail prices should continue to decline, lagging last week’s trend. For the current week ended December 3rd, diesel prices dropped by 5.4 cents to an average price of $3.207/gallon. This was the seventh consecutive week that retail diesel prices have fallen. During these seven weeks, the price decline has amounted to 18.7 cents/gallon. Prices fell in all PADDs. The national average price was 28.5 cents per gallon higher than it was one year ago. In the East Coast PADD 1, diesel prices fell by 4.8 cents to arrive at an average price of $3.229/gallon. Within PADD 1, New England prices declined by 3.4 cents to average $3.310/gallon. Central Atlantic diesel prices fell by 5.3 cents to average $3.394/gallon. Lower Atlantic prices declined by 4.7 cents to arrive at an average price of $3.098/gallon. PADD 1 prices were 32.5 cents/gallon above their prices for the same week last year. In the Midwest PADD 2 market, retail diesel prices fell by 6.8 cents to average $3.117/gallon. This was the largest price decrease among the five PADDs. Prices were 24.0 cents/gallon above their level for the same week last year. 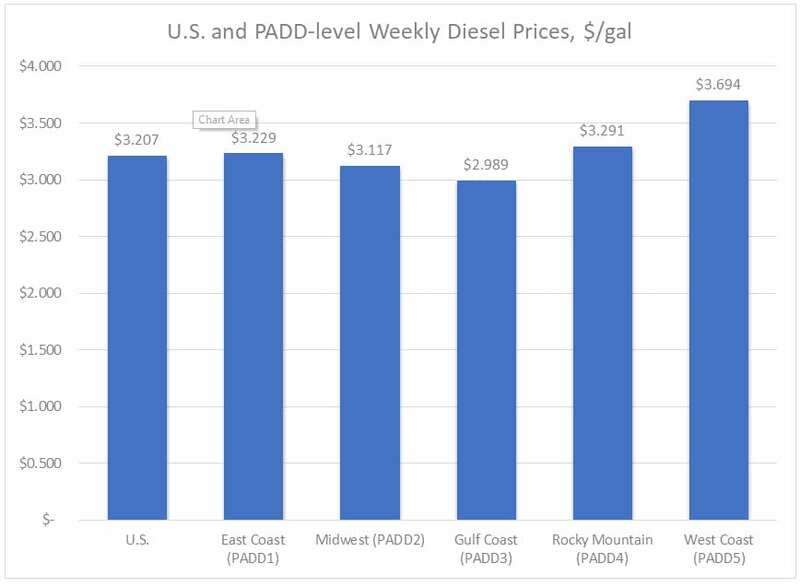 In the Gulf Coast PADD 3, retail diesel prices declined by 4.6 cents to average $2.989/gallon. PADD 3 is the first PADD where retail diesel prices have dropped below the $3/gallon mark. Prices were 27.6 cents higher than for the same week in the previous year. In the Rocky Mountains PADD 4 market, retail diesel prices fell by 4.8 cents to average $3.291/gallon. PADD 4 prices were 27.2 cents higher than in the prior year. In the West Coast PADD 5 market, retail diesel prices fell by 4.5 cents to average $3.694/gallon. This price was 32.1 cents above its level from last year. Prices excluding California fell by 4.9 cents to reach an average of $3.406/gallon. This price was 30.0 cents above the retail price for the same week last year. California diesel prices dropped by 4.2 cents to arrive at an average price of $3.922/gallon. Until last week, California had been the only state where diesel prices exceeded $4/gallon. California diesel prices were 33.7 cents above last year’s price. U.S. retail gasoline prices dropped sharply by 8.8 cents to average $2.451/gallon during the week ended December 3. Prices fell in all PADDs. The national average price was 4.9 cents per gallon lower than it was one year ago. Prices in PADDs 1, 2 and 3 are below their levels of one year ago. Retail prices for gasoline have fallen for the past eight weeks, slashing an astonishing 45.2 cents/gallon off the average retail price. For the current week ended December 3, East Coast PADD 1 retail prices for gasoline dropped by 7.6 cents to average $2.422/gallon. The average price was 6.9 cents below last year’s price. Within PADD 1, New England prices fell by 6.4 cents to average $2.583/gallon. Central Atlantic market prices dropped by 6.0 cents to average $2.585/gallon. Prices in the Lower Atlantic market dropped by 8.9 cents to average $2.274/gallon. In the Midwest PADD 2 market, retail gasoline prices plunged by 11.6 cents to arrive at an average price of $2.198/gallon. This was the largest price drop among the PADDs. Three weeks ago, PADD 2 became the only PADD where gasoline pump prices were lower than they were one year ago. PADD 1 and 3 joined PADD 2 in this distinction last week. Prices for the current week were 15.9 cents/gallon lower than they were for the same week last year. In the Gulf Coast PADD 3 market, gasoline prices dropped significantly by 9.3 cents to average $2.123/gallon. PADD 3 continues to have the lowest average prices among the PADDs. Prices for the week were 12.7 cents lower than for the same week in 2017. 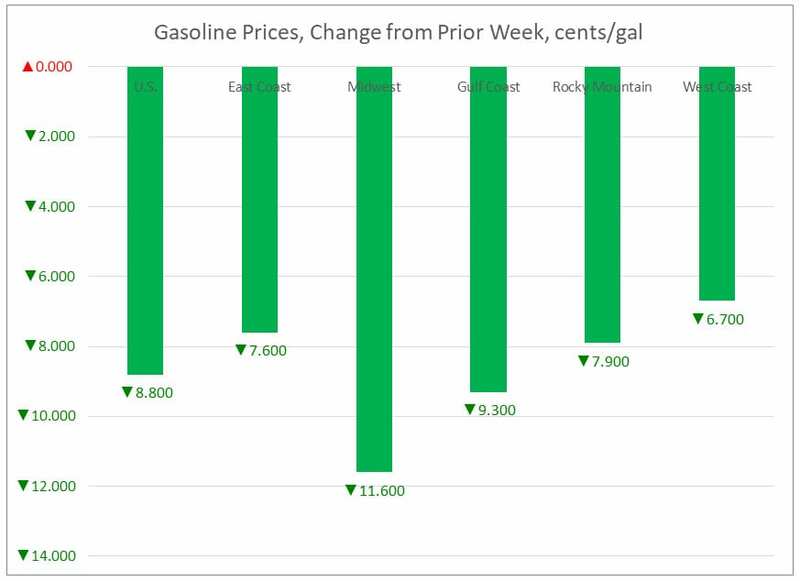 In the Rocky Mountains PADD 4 market, gasoline pump prices fell by 7.9 cents to arrive at an average of $2.717/gallon. Prices were 18.3 cents higher than at the same time in 2017. In the West Coast PADD 5 market, retail gasoline prices fell by 6.7 cents to arrive at an average of $3.241/gallon. This price was 23.5 cents higher than at the same time a year ago. PADD 5 continues to have the highest gasoline prices among the five PADDs. Excluding California, West Coast prices decreased by 5.5 cents to average $3.045/gallon. This was 30.6 cents higher than at the same time in 2017. In California, pump prices dropped by 7.9 cents to average $3.399/gallon. California prices were 23.9 cents per gallon above their levels from last year.